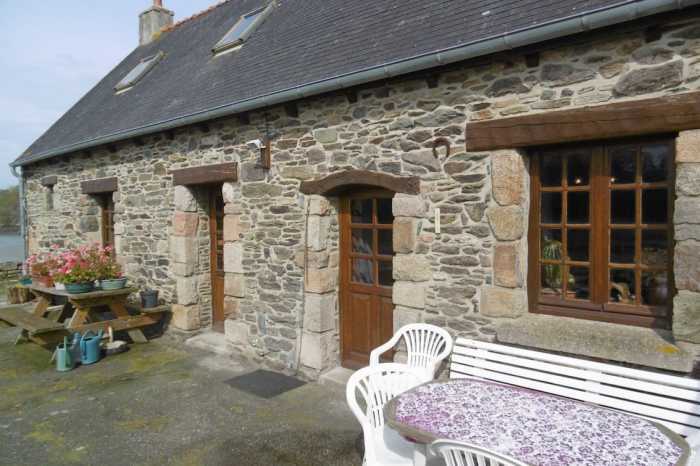 Properties for sale in Brittany, France - AHIB-1-PO-086 Treguier 22220 Remote chocolate box cottage on the edge of the river with stunning southerly views. Pretty stone 2 bedroom cottage with unobstructed views over the water. Traditional cottage offering: kitchen/breakfast room, spacious lounge with stone fireplace and wood burning stove, wooden staircase to large landing that has been used as a guest bedroom. Nautical themed bedroom looking west over the river with porthole style windows, a further large bedroom looking down the river. WC with bidet and washbasin. There is sufficient space to add a shower cubicle if required. In addition, downstairs in the adjoining building a utility room with gas boiler, tank and pump for the water (connected to a spring) separate bathroom with WC. Workshop with loft space above. There is a small area of garden and a very large south facing terrace making this the ideal place to entertain or soak up the sunshine for most of the day. This is a conservation area so the possibilities of any external alterations are unlikely. The current access road is a right of way but the owner assures me that the local authorities have agreed to a new road uniquely serving the property. Without doubt the property needs updating and the electrics replacing otherwise the diagnostics were quite favourable. The location is quite unique and if you want total peace and quiet with no passing traffic apart from the indigenous wildlife this could be the place for you! Tile Stone fireplace with wood burning stove. 1 Kitchen 17 m² South Tile Stone archway to lounge. 1 Laundry room 7.5 m² South Tile gas boiler, water tank and pump, doorway to bathroom. Stone The whole area infront of the cottage with spectacular vies over the estuary. 1 Landing 11.5 m² South Wood floors open landing with guest bed. 1 Bedroom 10 m² South Wood floors Porthole windows overlooking river. 1 Lavatory 4 m² North Tile lavatory bidet and hand basin, room to add shower cubicle.